why do you need a Xintore monitor stand? With the development and progress of network technology, our work and life are increasingly inseparable from computers, and we have to contact with computers almost every day. There are many people who suffer from poor eyesight and neck fatigue, This is all caused by a long time of incorrect posture , which can do great harm to your body. Then you need to adjust the position of the you and the computer, monitor stand is such a product, it can adjust the position of you and monitor, and will provide you with some other auxiliary functions, For example, quickly charge your phone, charger, fan, etc., and do not need to be on the computer, because it can connect directly to the power source. And, There's room for a keyboard underneath, handy space for extra papers and even compartments for office supplies. Shouldn't you have such a product? 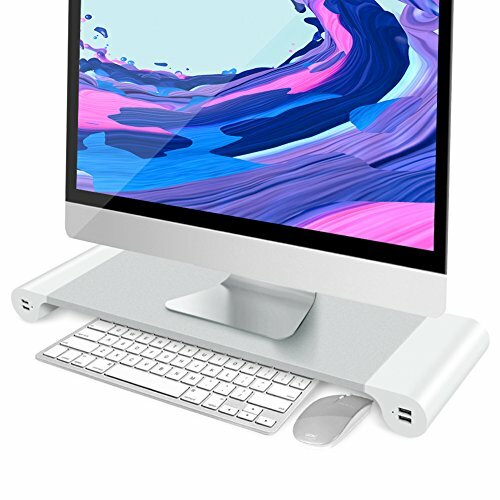 The size of the monitor stand is (21.6*6.6*2) in, rising your screen up to a suitable viewing height, relieving the burdens on your neck and shoulder, because this sleek and sturdy stand puts your screen at eye level, make your working at computer easier. Supports a maximum weight of 55 lb (25 kg) of monitors, printer, computer, laptop. Ergonomically designed ,This monitor stand is made of Aluminum alloy and ABS plastics legs, supports a maximum weight of 55 lb (25 kg) of monitors, printer, computer, laptop, without wobbling and the surface will not sag within its weight capacity. Has a separate external power supply, cable length is 55 in / 140cm , you can charge the device at any time without connecting to a computer, same function as USB charger,4 USB 3.0 ports to connect and charge almost all devices, total output current is 4 A, charging speed comparable to the original, and at same time can make desktop line no longer clutter. Aviation grade aluminum alloy material, USES the edge curve grinding process. At the bottom of both ends with 8 silicone mat, increase the friction stable and non-slip, it also protect your desktop from scratches. When you don't use the computer, you can receive keyboard and mouse tuck neatly underneath the 1.5in (4 cm) high stand to clear up desk area. make your desktop clean and tidy. If you have any questions about this product by Xintore, contact us by completing and submitting the form below. If you are looking for a specif part number, please include it with your message.